Plasma treatment of PDMS used in microfluidic devices is used to produce a permanent bond between surfaces and to improve analyse flow within microfluidic channels. PDMS (Polydimethylsiloxane) is by far the most popular material used in microfluidics research where it is deployed for rapid prototyping with minimal cost. 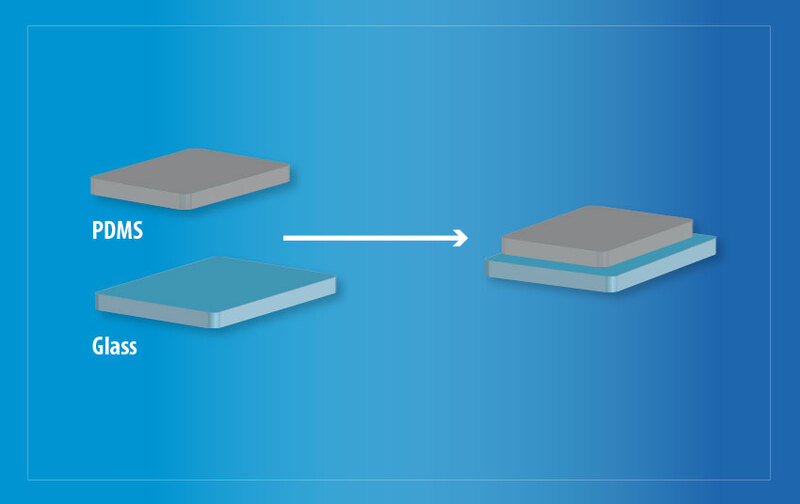 PDMS however requires a surface treatment step in order to produce strong, conformal bonds between surfaces. Plasma treatment of PDMS increases exposes silanol groups (-OH) at the surface of the PDMS layers so that they form strong covalent bonds (Si– O–Si) when brought together with glass. These covalent bonds form the basis of a practically inseparable seal between the layers. Henniker’s systems are routinely used for plasma surface treatment of PDMS in microfluidic laboratories throughout the world. They can operate with both oxygen and air. A typical process would use air and activation at low power for tens of seconds. The surfaces are brought into immediate contact for the best possible bonding results. The Henniker HPT-100 and HPT-200 plasma surface treatment models are simple to use bench top instruments each with digital mass flow controllers which allow precise and repeatable plasma treatments whilst avoiding the common problems associated with manual needle valve gas inlets. This means the same conditions each and every time. The larger HPT-300 and HPT-500 instruments feature multiple tray loading options and allow for increased capacity or treatment of larger devices. Each model of HPT plasma treatment system also features a continuously variable power level from 0-100% of full range so that power levels can be set precisely , both at low levels for activation of PDMS and at higher levels for effective cleaning and activation of glass. We have a detailed application on the plasma treatment of PDMS, available for download or read on for the full article. Polydimethylsiloxane (PDMS) – is a member of a group of polymeric organosilicon compounds that are widely known as silicones. It is the most widely used of these compounds and is featured in applications ranging from medicines and cosmetics to silly putty. In this application we concentrate on the use of PDMS in microfluidic device fabrication. Fig 1. Molecular structure of PDMS. PDMS has a number of properties which make it favourable for use in creating microfluidic devices. Despite these advantages PDMS has one key limitation, it’s poor adhesion to glass. When used in the microfluidic application this can lead to premature device failure. Henniker’s systems are routinely used for plasma surface treatment of PDMS in microfluidic laboratories throughout the world, here we show you how to achieve optimal device bonding results using our equipment. The Henniker HPT-200 system is developed and optimised to produce consistent plasma treatment performance for reliable & repeatable bonding of PDMS. Both the glass and PDMS substrates are treated with air plasmas, at low pressure, with all settings under microprocessor control. On both substrates the treatment is effective at removing hydrocarbon groups (CxHy) leaving behind silanol groups on the PDMS and OH groups on the glass substrate respectively. This allows strong Si – O – Si covalent bonds to form between the two materials via the process as shown in Fig 2. Contact angle measurements indicate whether a surface is hydrophobic (over 90°) or hydrophilic (under 90°) by the angle a water drop makes with the surface. Here we can see that increasing the time or power of an air plasma treatment on PDMS leads to the surface becoming more hydrophilic. Fig 3. Contact angle variations with increasing treatment time at 25% power (left) and increasing power with 10secs exposures (right). Both show a switch between hydrophobic to hydrophilic behaviour. Insets show example droplets. This switch to more hydrophilic behaviour shows that the proposed treatment has been a success and that the – OH termination associated with silanol groups is now exposed, leading to improved bonding of the PDMS to the glass substrates. XPS is a widely used to technique to analyse the functional groups present on the surface of a substrate. Here we use XPS to show how C-O groups are absent prior to plasma treatment (in this case with oxygen plasma) and present after the treatment. Thus indicating a successful surface modification. Fig 4. XPS results from untreated (Top) and oxygen treated (Bottom) samples highlighting the presence of C-O groups after treatment. Bonding of PDMS to glass is a key issue in the use of the material in fabricating microfluidic devices, however when using a Henniker model HPT-200 benchtop plasma system to treat PDMS substrates alongside glass substrates, this problem has been addressed. Plasma treatment has been shown to improve the wettability of both surfaces. Leading to increased bonding between the 2 substrates which is highlighted in Fig 6. The system can also be optimised to bond PDMS to thermoplastic materials. Fig 5. 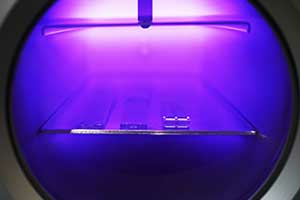 (left) PDMS microfluidic channels undergoing plasma treatment. Fig 6. (right) Bonded PDMS and glass following a plasma treatment in a Henniker HPT-200 machine. We gratefully acknowledge the input and discussion with Dr. Alex Iles of the Pamme Group at Hull University, UK.